It's not that we hadn't seen cases with windows cut-outs before, it's just that LG brainstormed some clever twists to sell theirs. Not only does the circular window show the time and date in terrific Moto 360-like watch-faces, it also shows notification icons and gives users access to basic functions, such as calls, music controls, and camera without them having to open the cover. 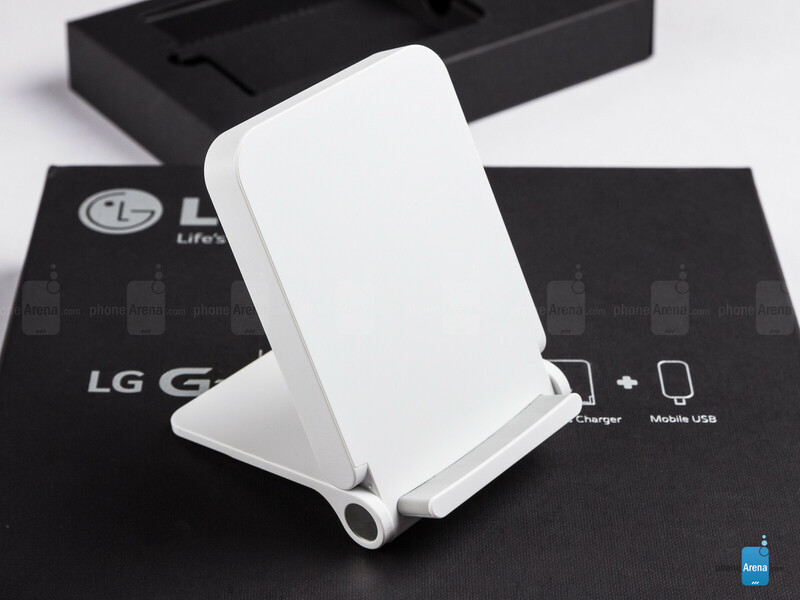 The addition of wireless charging - of which owners of Korean and USA LG G3 models are deprived - is the icing on the cake. Alas, this cake is an expensive treat. The official Quick Circle case by LG sells for $45 to $60, and enjoying wireless charging the way LG intended with its official WCD-100 charger could cost you about as much. Considering a healthy selection of affordable third-party cases (sans-wireless charging) is available next to the official one, is the heavy price LG asks for justified? Nice looks, solid grip, and relative slimness. 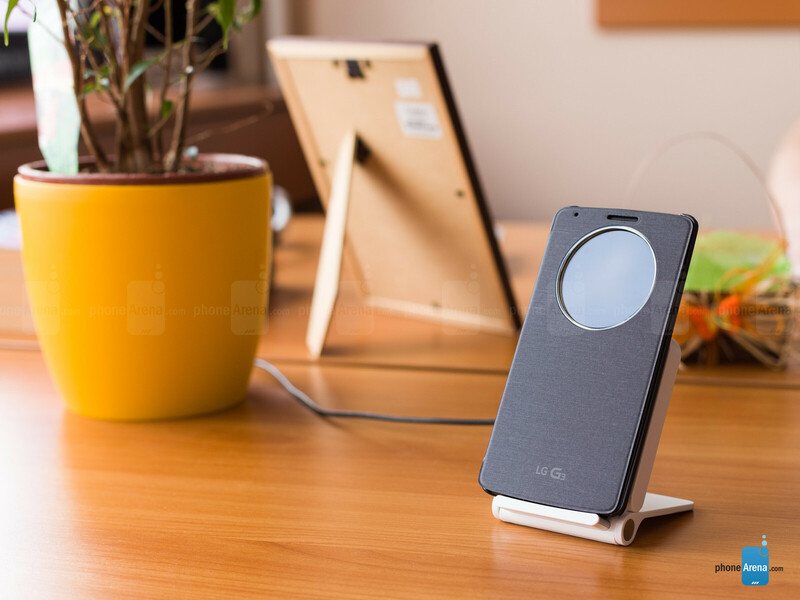 The Quick Circle case is alluring with its nice looks, solid grip, and relative slimness. 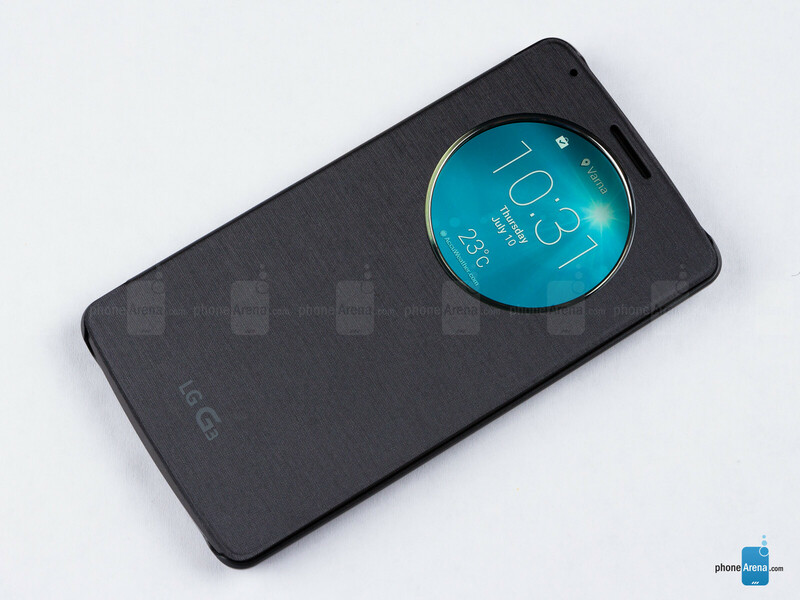 Made entirely of plastic, the front cover features a fabric texture, while the back panel is all plastic and harkens to the LG G Pro 2's design. From both sides, the case feels pleasantly rough on the fingers and there's no slipperiness whatsoever. The case has nothing to do with how the LG G3 itself looks and feels, but it's a good fit for the smartphone. The case looks terrific when exposed to light, emitting an impressive metallic glow. Ergonomics wise, the case adds little bulk to the phone's sides, allowing the LG G3 to retain most of the effect of its slimmed bezels. The display cover folds completely to the back, letting users lay the phone on the table or use it right handed without any annoyances. As you might or might not know already, the Quick Circle case acts as a replacement back panel paired with a display cover. In a way, this ensures complete safety for the phone's original back panel, as it's going to stay safe at home while the case handles all eventual calamities. Korean G3 owners, beware! The case that LG sent us didn't have the cut-out for the antenna to the top left, which made it impossible to use with Korean models. If you plan on purchasing one, contact the seller and make sure the cut-out is there first! That aside, replacing the back panel is as simple as removing the original one and installing the case. Right off the bat, the LG G3 recognizes it's in the Quick Circle case, and when you double tap the screen, the watch-face and shortcuts will show up. 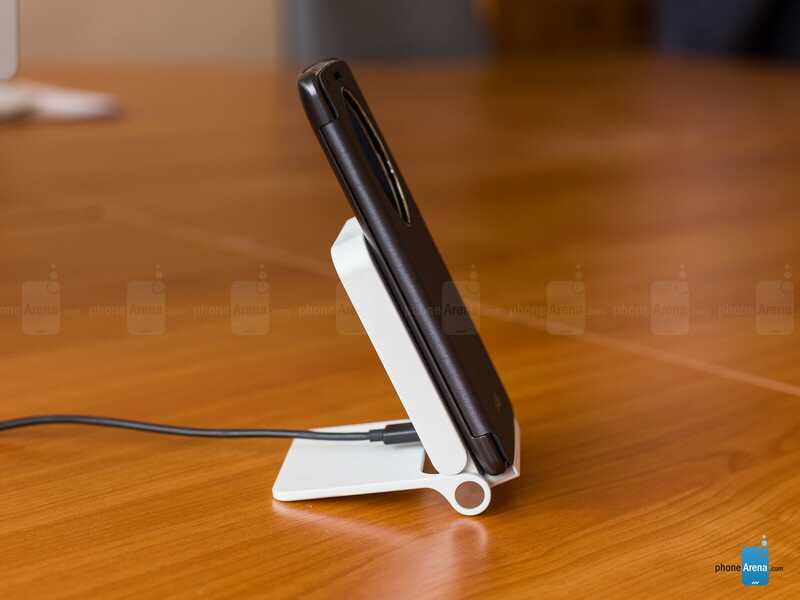 Using the wireless charger is an instant as well - just put the phone on the cradle. Although the case lacks a magnet to keep it closed, the display cover doesn't stick out and firmly covers the screen. The build quality is good, but the case isn't exactly rugged. It will protect the G3 from left and right, while its top and bottom remain partially exposed. For the price, we would have preferred full top and bottom coverage. Additionally, the case completely covers the G3's front camera, making selfies impossible to take without opening the cover. I'm confused as to why this article says that the US models don't have wireless charging, but all Verizon reps have been saying it does support Qi wireless charging out of the box. 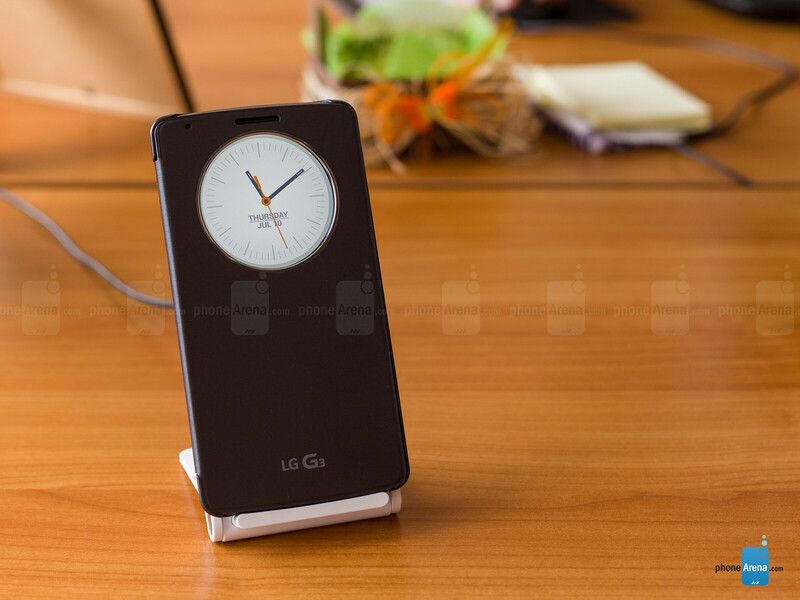 The Verizon LG G3 *supports* wireless charging out of the box. No software updates are needed. But you still have to have a qi compatible back. If you look inside the back of the phone, there are two little metallic squares. If you look at the inside of a wireless charging back, there are four of these. So yes, technically, Verizon is correct, the phone *supports* wireless out of the box. But it doesn't come with the things it needs to make use of that. I have a Verizon LG G3. Question -- any noticeable hit to the battery life when using the clock a lot? Thanks, that's good to hear. I'm going to take a look at one of these soon. It'd be good to have for developing apps that need to work with high PPIs. I own a G3 and I admit to having design envy for the HTC One M8. It's a downright impressive smartphone and truly one of the best Android phones out there (camera aside). However, the G3 is my kind of guy in every aspect - from the clever engineering and design to the simplicity of the form and interface. As for premium-ness, I'm a case guy, so I end up holding plastic all the time while Chris P. makes fun of me. I bought this device Saturday and LOVE it! I am coming from a HTC One M7 which was a great device to be sure. The camera was severely lacking on the HTC though. This LG is incredibly fast and just gorgeous from every angle! I have a Versus Quick Window case that is faux leather in a caramel color. It is very nice and a bargain at $18 from Amazon. ---Question--- How can adjust the 'settings' of the quick window? Like make it stay on longer??? Also I just registered with Phone Arena and can't figure out how to 'Add phones I've had or have? Hi. Does anyone know where to buy this case? 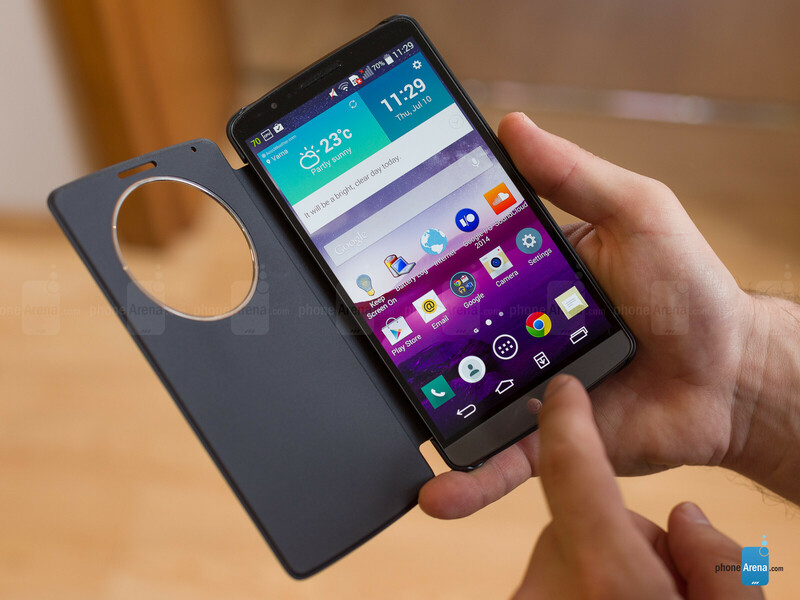 My wife just got an LG G3 which she loves and we are now interested in the case as well. I can't find it anywhere, but there are many knockoffs that bill themselves as quick circle cases. Funny, I went to LG's site and asked via chat. When I told them this was Sprint, here was the response back: "We only handle information for AT&T and Verizon" Had I known of this "stellar" support for their device I would most certainly have encouraged her to consider the HTC M8 instead. Three days with the phone and LG is already a disappointment. If you search eBay, there are some out of China that support wireless. Pay attention though, there is a wireless charging version and a NON wireless charging version. And there's a Korean (?) version. Make sure you verify the actual model of the phone (verizon is VS-985 4G) as well. I got the Versus model from Amazon for $18 and LOVE it!